GrammarPlanetis an online, comprehensive program that teaches grammar and punctuation lessons. The lessons consist of a video, quizzes, printable notes, practice questions, and tests. Upon logging in and beginning your lesson, you watch the video with the corresponding notes in hand. During the video, comprehension quizzes are given throughout to ensure you are paying attention to the material. If you pass the quiz, the video continues; however, if you fail, you must rewatch that section. After the video practice questions are presented so you can put the new information to use. If you pass the practice questions, an exam is given to complete the unit. The GrammarPlanet system is unique because it is responsive to your quiz, practice, and test answers. If you need more help understanding the concept, you’ll receive additional questions. There is no participation time limit so students can take as much time as needed to master the material. The overall “practice makes perfect” style shows the creator’s desire for every participant to feel comfortable moving forward. Since grammar isn’t my area of expertise, I appreciate the passing stipulations in place. Bear said he also liked the practice questions and quizes during the lesson because it helped him pay attention to the video even more. My favorite features of this program are the Teacher mode because I can add my children at my leisure. Each student needs a personal username and password to access the account. All your family’s progress is shown is provided in the Teacher Dashboard. If someone performed poorly on a unit then you can reset it which will erase all their data for that unit. The unit will then show as not completed and the student will start there the next time they log in. Bear’s favorite feature was the printed notes because you can use them to help during the practice and tests. We are keeping the notes in a binder so we can refer to them as needed. It is suggested, per the website that no more than 15 minutes at a time be spent using this program. Of course, these recommendations can be adjusted to fit your family needs. Adjustments can also be made if an upcoming deadline, standardized testing or ease of understanding causes you to do a bit more. They also recommend doing the program every other day, giving your brain time to take in the information. Upon following the suggestions our weekly schedule started with the video lesson and quizzes on Mondays. On Wednesdays, we continued our studies with practice questions and finished the lesson by testing on Fridays. During the review period, we did run into a few issues with sign-ins. We each signed in at least three times a week but often received notices that we hadn’t started a lesson at all. The videos also only played perfectly via the Google Chrome browser on my cell phone. On the iPad and mobile phone, the video was extremely hard to hear even with the audio turned up to the maximum level. I used the Bluetooth speaker to add volume but unless we were in a quiet room, the videos were still hard to hear. Over time, the sign-in glitch appeared to be fixed but the sound is still an issue. GrammarPlanet currently offers their website for FREE to everyone. In this program, advertisements play prior to the lessons beginning. There is an option to upgrade to an advertisement free version of the program for $39. This is a one time fee that provides lifetime access to the user. Grammar is often a touchy or ignored subject in most homes and workplaces. I’ve heard many conversations about how something should or should not be used. In a world a self-proclaimed experts, I’m grateful for GrammarPlanet and everything we are learning. We all enjoy the program so much and have decided to make this a weekly staple in our home. 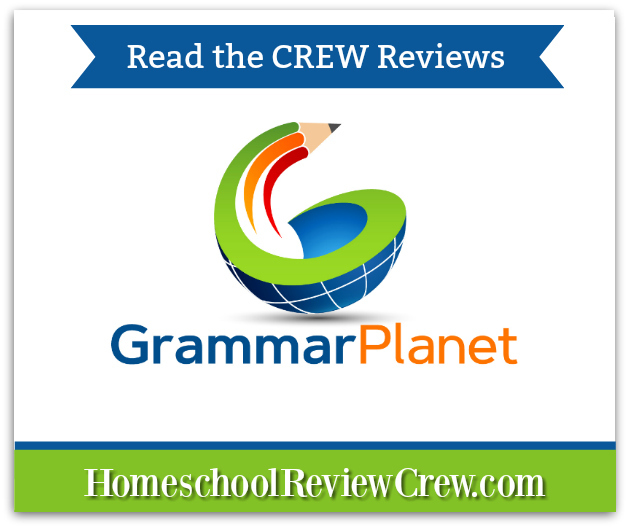 Click the image below to read more Crew reviews about how this website worked in their homeschool.